Lewis Sperry Chafer was cofounder and president of Dallas Theological Seminary. The SwordSearcher combined book module Essential Works of Lewis Sperry Chafer contains the nine volumes listed below. 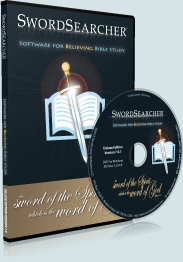 As with any book in SwordSearcher, it can be searched instantly by word or phrase and scripture reference, with relevant sections optionally linked in the Bible margin. 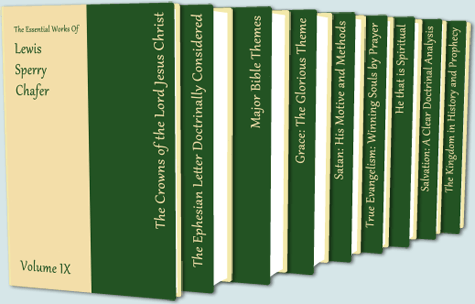 "Many valuable books have been written on the general subjects related to the kingdom. ...but no similar work covering, in brief form, the historic and prophetic aspects of the kingdom in their relation to the present age-purpose was known to the writer: hence this volume. It is hoped that this book will prove a comprehensive, if not exhaustive, treatise on this important theme." "This book is presented as a simple Gospel message and is in no way intended to be a contribution to theological discussion. It is evangelistic in purpose. The writer has hoped that this statement of God's saving grace may be adapted to the spiritual understanding of the unsaved that they may grasp the way of salvation from these pages and so be led to believe on the Lord Jesus Christ and be saved." "True spirituality is that quality of life in the child of God which satisfies and glorifies the Father. It brings celestial joy and peace to the believer's own heart. Upon it all Christian service depends. Since God purposes to work through human means, the fitness of the instrument determines the progress made." "What is here written is the result of evangelistic experience and study covering a period of almost a score of years. During this time the trend of the writer's conviction has been away from emotional and superficial methods, which are too often thought to be the only possible expression of earnestness and enthusiasm in soul-winning, and toward an entire dependence upon the Spirit to do every phase of the work that has been assigned to Him in the purpose of God." "The world has been willing to comply with the wishes and projects of Satan to the extent of ceasing to believe that he really exists; this unbelief being most advantageous to his present undertakings. Yet the opinions of men have never changed the facts of revelation, and, according to Scripture, Satan exists; still possessed with great power and influence over the affairs of men--a power and influence to be increasingly dreaded as this present age advances." "Through false emphasis by many religious leaders, Christianity has become in the estimation of a large part of the public no more than an ethical system. The revealed fact, however, is that the supreme feature of the Christian faith is that supernatural, saving, transforming work of God, which is made possible through the infinite sacrifice of Christ and which, in sovereign grace, is freely bestowed on all who believe." "This book is in no sense intended to be a treatise on systematic theology. In its preparation, a limited number of the most vital and practical themes have been chosen, and an attempt has been made to adapt these brief discussions to the needs of the untrained Christian." "Many books have been written on the Ephesian Letter. Some have been exegetical and some devotional. The distinctive aim of this treatment is doctrinal and as this Letter has not been thus developed by writers generally it is hoped that the book may serve some worthwhile purpose and be, in some measure, 'to the praise of the glory of his grace.'"